For Retired Investors, What Is The Objective? Investors invest for a reason, but there are many factors in their lives which alter their reason for investing. A young investor is often aiming to increase his bottom line, targeting all investment decisions toward Growth. Along the way, that investor will at some point aim some investment decisions towards providing financial Security, especially when he or she begins to build a family. And eventually, that investor will no longer be young, and will want to consider what is going to happen to his or her financial fortunes in retirement. That is when investment decisions will include choices aimed at creating Income in retirement. While many investors vary their investment choices to include all three objectives, all investors have a primary objective for their portfolio. 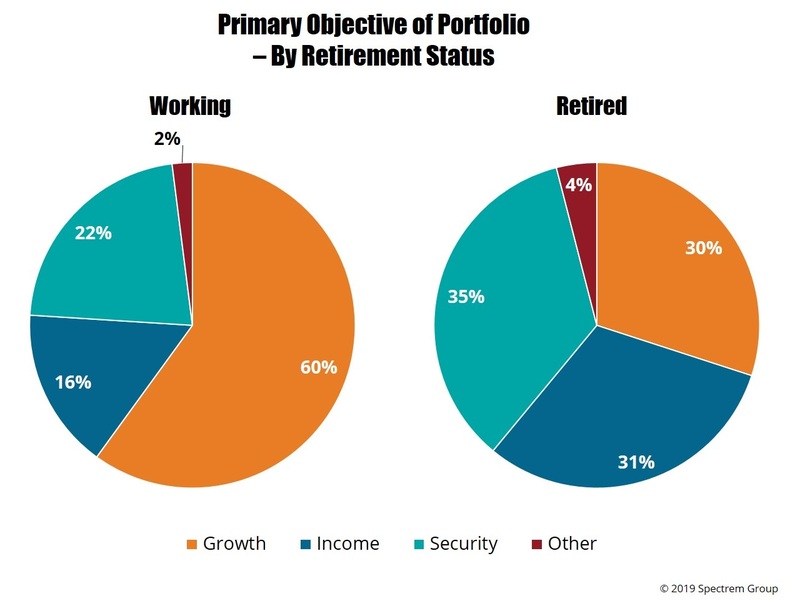 For retired investors, the primary objective is really a mixed bag, since most retired investors have already made key decisions to provide for income during retirement. In Spectrem’s study on the subject – Primary Objective of Portfolio – investors were asked to state the primary goal of their investment decisions. Overall, Growth won out at 43 percent, but there was a distinct split in that category between retired and working investors. A great deal of that split had to do with age, since retired investors are older and are relatively settled in their expenditures and liabilities. Among retired investors, Security got the highest percentage of responses at 35 percent, but that was closely followed by Income at 31 percent and Growth at 30 percent. This is an indication of a fact some advisors fail to recall, that retired investors are not necessarily done with their investing participation. Retired investors obviously still have some of their investable assets in Growth products, even if they hope to pass the gained revenue from those investments on to the next generation. The study also examines the strategies investors use when investing, whether they are active investors who go in and out of products and stocks as their value rises and falls, or if they are quiet and steady investors who sit on an investment and watch it grow slowly over time. Among retired investors, 37 percent primarily use the Passive strategy, also known as buy-and-hold, in which an investment in a stock or stock mutual fund is made and the investor sits and waits for it to accrue value over time. This is a popular strategy among all investors, with 33 percent of retired investors using that strategy primarily. A similar strategy called the Conservative strategy is investing with an eye toward maintain the principle investment. Twenty-two percent of retired investors employ that strategy as the main aim of their investments. However, 14 percent of retired investors primarily use an Active strategy, which is what it sounds like, moving in and out of investments based on factors in the markets or economy which signal that one stock or product is going to increase in value and another is going to decline. Such a strategy is popular with one-quarter of all working investors, and some retired investors maintain that level of participation upon their retirement.